Human beings are obliged to make difficult decisions in hostile places. My elder daughter when asked for a date used to filter out the potentially unworthy male by asking him to identify the characters in ‘The Magnificent Seven’. Those not familiar with the film can be forgiven for thinking this test merely arbitrary and capricious. But what she understood is that any man not familiar with ‘The Magnificent Seven’ will invariably be limited in their understanding of masculinity and responsibility. In the last fifty years, the reputation of the film has suffered. Cinema snobs like to claim that the Kurosawa original ‘Seven Samurai’ is superior and later generations have compared it to modern day realism and excess and dismissed it as sanitised distortion. The Japanese movie is a masterpiece but a superior Western with subtle messages, careful characterization and a landscape that evokes the glory of freedom and space can compare to anything. True, ‘The Magnificent Seven’ belongs to the glamorous Sixties. The actors are charismatic rather than authentic but this reflects the liberal humanist values that prevailed in those enlightened times. This is not a bad thing. We only think it so because we have been so long groomed on fascist fantasies. The movie begins with a farmed field and symbolizes how work is essential for most lives. The corn stacks are obvious. The human beings are barely discernible, insignificant in a land that is, to remember characters from the classic Boetticher Westerns, ‘a lot of empty’. The humans we notice first are the bandits and we only notice them because we can see their horses. The message is clear, sacrifice means invisibility. 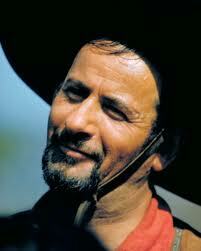 Eli Wallach, the leader of the bandits, arrives amidst self-important ceremony. This is not the social bandit admired by left-wing historians. Wallach explains to the leaders of the village that because times are tough the farmers will have to forfeit their produce for his gang. Meanwhile, he complains about the moral laxity in others – the lack of religion and the shamelessness of women. Like David Cameron, he preaches austerity and morality for the poor while insisting that life for the rich should remain unchanged. The scene has always had impact. In the economic climate of today, it resonates. Tombstone who do not want Native Americans buried in Boot Hill. Before he became a director, John Sturges worked in various technical roles including, crucially, that of editor. If there is a wrong shot or a mistimed moment in this scene, I have not noticed. The sequence is perfect. One character that is interesting is the man who sells ladies’ corsets. He is not a warrior but exists as a reminder that man does not need war or conflict to have integrity and worth. The warriors have charisma but this message is reiterated throughout the movie. Indeed, it is the hero worship by the children of the violent that is the cause of the needless death of Charles Bronson who, like Ernest Borgnine in ‘The Wild Bunch’, exists to remind the audience of the difference between self-serving glory and real heroism and responsibility. Bronson understands the burden of work and not surprisingly we first see him chopping wood. ‘The Magnificent Seven’ makes its machismo heroes as appealing as any but this heroism is constantly undermined by what they reveal in conversation. The men have no sense of medieval honour like the Samurai. They go back to defend the village because they are unwilling to settle for premature retirement and a normality that is beyond them. In this sense, the heroes are inferior to the villagers tied to their land and women. But if the importance of the villagers to normal existence and domesticity is acknowledged, the farmers are not romanticised. Their human frailty is revealed and the village has the usual cowards and braggarts. Despite the admissions from the seven, we are seduced by their male charisma. It is a beguiling dream, heroism that leads to self-sufficiency, independence and omnipotence. This promise is most potent in the James Coburn character, which is why it is so shocking but important when he dies at the end of the film. Violence and destiny are always independent of fate. director indulged an actor who lacked their presence. Sturges, though, understood that the immature narcissist needed to dominate the film otherwise the heroics would ensure the film was simply a fantasy about masculinity. The scene when Buchholz pompously performs for the village has to be endured. The audience, like the people in the village, is embarrassed but the leader of the seven chooses that moment to say, ‘Now we are seven’. Brynner understands that the group needs flawed humanity to be complete. almost touch. Earlier in the film, the love between the two men is suggested when McQueen says to Brynner, ‘I just want you to know that I think like you.’ These ‘lovers’ will escape drudgery and work. Unlike the four of their gang who have perished in the final battle, they have survived. They will be blessed with integrity and romance, for the moment anyway. The film makes clear what is missing from ‘Seven Samurai’. The warrior has an eternal choice. He can either take money and comfort from the powerful or support the powerless in their struggle against their oppressors. He may sacrifice wealth but the fight against those with money will give him spiritual sustenance. The film does not have a happy ending. Not only have some of the most admirable characters in a Western been killed, the survivors know that they will be blessed only temporarily. Eventually, the normality that they flee will have to be experienced, and because of what they have forfeited, commitment and reward, they will regret the triumph of romance over consequence. The music by Elmer Bernstein is great but it disguises the truth about the film. This is a Western that subverts and challenges the genre. Finally, there is a question for the reader. Why is there no mention above of the names of the characters and why are identifications limited to the surnames of the actors? Well, the dangerous places still exist and women will always have to make difficult decisions about men. Knowing if the man in sudden pursuit has seen and understood ‘The Magnificent Seven’ offers no guarantees but it will help. If you want to read about horror click here. 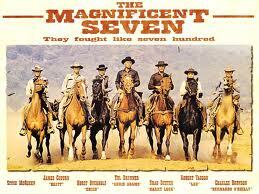 ‘The Magnificent Seven’ has always been another ‘boys own’ film for me , in the same way as ‘The Wild Bunch’. However, Howard’s persuasive piece may very well lead to a complete reappraisal. Very thought provoking and challenging, as always. Another interesting piece. I remember watching ‘The Magnificent Seven’ as a teenager and it still remains as one of my Dad’s favourite films of all time. Thanks to this awesome article, I am eager to watch the movie one more time in order to see if it makes a difference to my first opinion, which was that it is a good film but that is it. Probably it is the best western I have seen, although I have only ever seen a handful. A must-watch-again film for me now! This is one of my favourite westerns! from the gun fight to protect the dignity of old Sam, to the defeat of Eli Wallach’s Bandit, the film is loaded with themes. In the end, the gunfighters are killed or they ride into the sunset just as various seasons come and go, but what remains is the farmers and their lands. 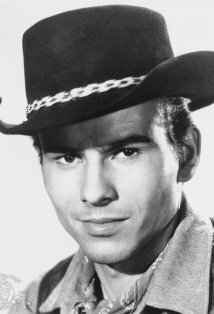 Chico ended up being a farmer, Brynner showing foresight, originally did not want him as part of the group. Harry came for the money and “unstated gold”, Charles Bronson came because at the time he felt 10 dollars sounded like a lot, Brynner came because he had been offered lots before but nobody had ever offered him ‘all’ The gunfighters were a dying breed by then, the west was getting civilized, gunfighting jobs were getting fewer that Steve MacQueen was thinking of working in a grocery shop, and their latest job was south of the border in Mexico. 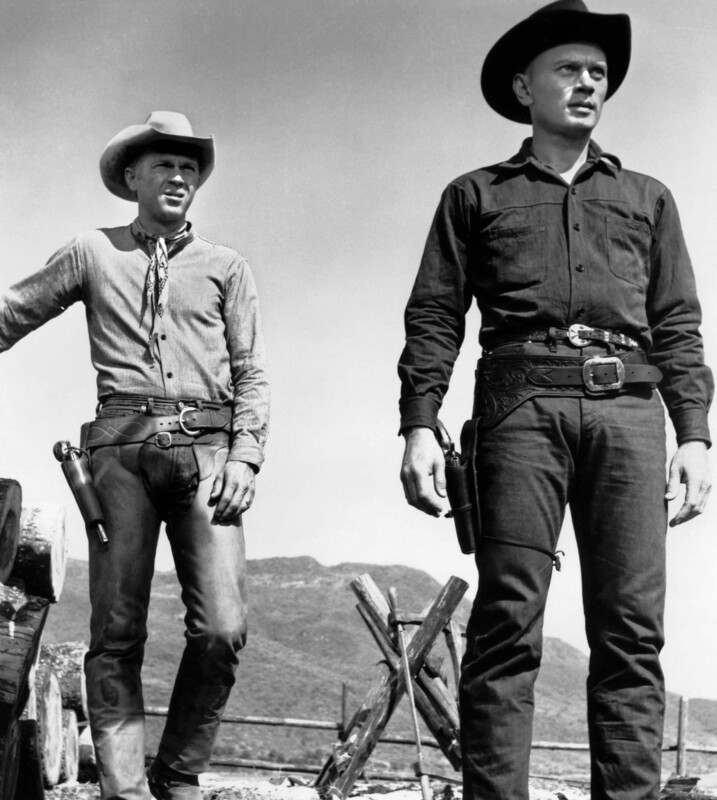 The final scene was one of the camaraderie of arms with Brynner and MacQueen realizing they were the last of their breed, while Chico left gunslinging to be a husband and a father. Eli Wallach could not fathom why the 7 came back for such a poor miserable village, Harry came back thinking there was more money than stated, he died peacefully thinking the village had gold, the other 6 came back because they knew there were certain things money can’t buy, let alone 10 dollars.